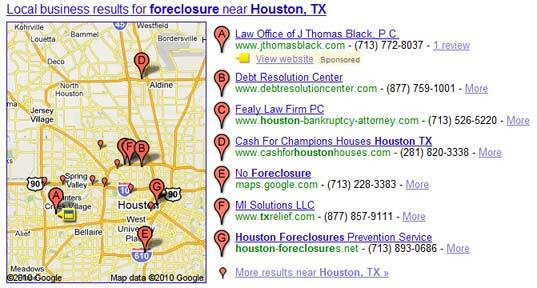 I recently noticed some sponsored links in the Local 7-pack in Google results. This is something that many SEOs and internet marketers have been expecting for some time, but this is the first time I’m seeing it. See that little yellow tag under the first result with a link to the advertiser’s website? Yeah, that’s new. You’ll also notice a yellow box next to that listing’s balloon on the map. So far, I have only seen this in Texas markets, possibly only Houston. So this seems like a new feature still in the testing phase, much like the sponsored-ads-above-the-map test run in the San Diego market a few months ago. Does the option to include that “View Website” link and yellow tags only appear for those who already have 7-pack rankings? Does the sponsored status basically guarantee a 7-pack ranking? Is Google limiting the amount of sponsored links displayed in the 7-pack? So far I have only seen one at a time. This will definitely be an interesting thing to watch for in the coming months. If previous geo-specific test runs are any indication, this feature won’t go nationwide for a long time, if ever. For those lucky enough to have this option available right now (that’s you, Houston business owners), this is an excellent opportunity to get a guaranteed Maps listing.